The concept of disruption has permeated our world over the last few years. For many of us, the workplace is an integral part of our lives, and it too is being disrupted. The impact is being felt by everyone. As companies try to adjust to a rapidly changing business environment, CEOs and leaders are finding there is a tremendous cost to the company. They are struggling to retain top talent, minimize training costs and increase productivity when employees are feeling overwhelmed. I wrote this book based on 20 years of personal and professional experience. While this is a business book, there is a very powerful backstory that inspired me to write this. Based on this life-changing experience I created a framework called the “Purposeful Workplace Experience™”. It is introduced in this book and my hope is that it will evolve your thinking and challenge you to reflect on “how” you and your company operates. The workplace is being disrupted, and we need to embrace new ways of working. We need to evolve. VUCA: Volatility, Uncertainty, Complexity and Ambiguity, these four factors dictate the current business world’s form according to Carolyn Swora in Rules of Engagement: Building a Workplace Culture to Thrive in an Uncertain World. In this book, Swora discusses how people react to the changing scene in their jobs. In many cases, employees become more and more disengaged as pressure continues to mount. In such a case, Swora proposes looking at the four factors (volatility, uncertainty, complexity and ambiguity) as reminders of the situation we are in. She also looks into the concept of psychological contracts, how to succeed because of being mindful of employees’ needs, and she delves into the difference between output and productivity, and the importance of considering the culture of an organization. One important feature in the book that stood out for me was the importance of collaboration over competition. These, however, are just tidbits. The book contains much more. Rules of Engagement by Carolyn Swora stands out from so many other books focused on the business world. In this book, there are many unique viewpoints proposed by the author. One particularly interesting discussion in Rules of Engagement is the use of the VUCA factors, not as a combined systematic model but as a nudge towards understanding our behavior and not becoming controlled by industrial factors. In this regard, Carolyn Swora also explains the importance of dealing with issues as they arise and not waiting for the storms to pass as they will be succeeded by other storms. Also, the importance of growing leaders and not just employees was another fascinating perspective. The practical examples were a great plus too. Ultimately, I got so many takeaways from reading Rules of Engagement. Any other reader interested in the topic will definitely learn from Carolyn Swora's expertise. There are so many things that can be overwhelming especially in today's work culture. People do not understand that there are differences between being a manager and being a leader. A manager’s primary duty is to handle people and to process HR metrics to accomplish the company’s goals, while a leader’s primary duty is to guide and empower people to make them feel a part of the company’s goals. 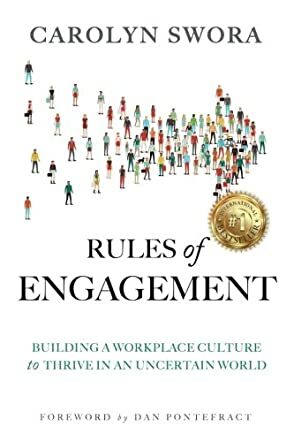 In Rules of Engagement: Building a Workplace Culture to Thrive in an Uncertain World by Carolyn Swora, the reader will learn two things: 1) the aspects of an effective leader, and 2) how an employee can thrive in the workplace. It has repeatedly been stated that technology makes our lives better, but does it? Technology has provided us with some great advantages for making some aspects of our life simpler, but it appears that employees are unhappier than before. In this book, Swora includes information, data, metrics and a summary at the end of each chapter to assist the reader in navigating through the workplace to gain satisfaction. Also, the Four Rules of Engagement offer some words of wisdom that you can use not only in the workplace, but in your personal life. For me, this book was so instrumental, not only because of Swora’s 20 years of leadership working in a toxic environment, but also because it is viewed from the employee’s perspective. This is the type of material that employees need because it will help to bring balance while offering solutions. Swora uses personal examples and stories to bring relevance to this book. The VUCA concept - volatility, uncertainty, complexity, and ambiguity - that Swora points out throughout the book gives a voice to the continual messages that ring throughout companies all over the world. By tapping into The Rule of Connection, The Rule of Collaboration, The Rule of Adaptability and The Rule of Equivalence, the reader will be able to build and thrive in an uncertain workplace. Rules of Engagement: Building a Workplace Culture to Thrive in an Uncertain World is a non-fiction book on how to develop and sustain a culture of growth, participation, and enthusiasm in the workplace. Carolyn Swora draws upon her own experience of working in the corporate world for several years to talk about tips and strategies that enable employees to feel excited and engaged in the workplace. Rules of Engagement is divided into three main parts, each with its own sections and sub-sections: an analysis of the most common current problems in the workplace and some of the reasons for this; how to understand contemporary culture, and introducing new ideas and approaches for leading and managing the workforce in today’s world; introducing the four rules of engagement of Connection, Collaboration, Adaptability, and Equivalence. Throughout the book, there are many anecdotes and personal experiences that Carolyn shares with readers, along with additional resources on the internet. I really liked Rules of Engagement: Building a Workplace Culture to Thrive in an Uncertain World by Carolyn Swora and thought it was obviously a subject that Carolyn knew well. She has also presented it in a very thorough and engaging style, which makes it an interesting read. I especially liked how she has pulled in data and research from various fields to explain human psychology, how individuals work, their needs and wants, etc. This comprehensive approach enables the reader to not only understand how to make changes in the workplace culture and leadership style, but also understand where it’s coming from. This is a great book for anyone working with or managing people in their workplace.